Physical Description Blue skin and a lean face, Aerdan’s overall appearance is sharp. He keeps himself extremely clean, and his antennae seem to flicker at the slightest movement. Other Family Mikan Jos, deceased, great grandfather - a somewhat famous Andorian developer of neurosurgical techniques. General Overview Dour and guarded, Aerdan strikes most as formal, polite and even-tempered. Most co-workers describe him as stubborn, focused, courteous and somewhat cold. He usually only confides in those he considers ‘family’ (in a figurative rather than a literal sense). Aerdan is not one to complain or share personal information freely unless pressured. 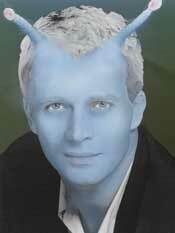 Despite his guarded, introverted personality, Aerdan is Andorian and is deeply passionate. He often expresses very little emotion, yet cares deeply for the people around him. He does not see people as scientific experiments, nor as numbers, but always as living beings (yet he does not often express this). Strengths & Weaknesses Personality notes: He has a high sense of honor and duty. He is more than willing to sacrifice his own career, health, safety and even life to uphold his own personal ideals. He firmly believes in the right of all sentient beings to live (and live without pain); however he also believes that a sentient being can forfeit that right though grave moral misconduct – and he will take action, even violent action against those who threaten what he holds dear. He can be incredibly stubborn and it is hard to get him to change his mind once he has settled on something. Because of this he very rarely discusses his plans with other people unless it is professionally required of him. This stubbornness extends to a feeling of duty towards the crew he serves with, and he is willing to do almost anything to ensure their safety. It is also perhaps the one thing that makes him a good medic. Aerdan himself will admit that there are many more intelligent doctors than himself. He often defers to better, brighter ideas on medical care. He is well trained, but his advantage is he is devoted to saving life and he doesn’t quit. Ambitions To somehow set himself apart from the rest of his family, to be the best father possible, to raise his daughter in a way that allows her to be free to choose her own career path. Hobbies & Interests Owing to Andorian culture, Aerdan feels that most leisure activities are a waste of time, though he is extremely curious about visiting others worlds, in a holographic or real sense. Aerdan is a neurosurgeon from a long line of neurosurgeons. He grew up hearing the tales of his great grandfather Mikan who developed rapid healing surgical techniques that made the science of neuro-surgery drastically safer. His father was a neurosurgeon, as was his grandfather, his uncle, his brother, and so on. Aerdan had little choice, his father had handpicked his curriculum from an early age to advance and excel at the family’s chosen field. The problem for the young Andorian growing up was that he didn’t particularly like neurosurgery. He was much happier exploring, and loved outings with his mother when she would tell him of the new species she had met, the planets she had gone to and the struggles of diplomacy. But, feeling a sense of familial duty Aerdan applied himself to the chosen profession. Training at the Andorian medical institute, working in a hospital named for his grandfather, expectations for him were high. While he did well, he didn’t make any amazing breakthroughs or brilliant advances, and so he found himself dismissed and ignored in favor of his brother who took to the familial calling with ease and relish. Aerdan tried to focus his energy into a wider variety of study, but his father kept reining him in and focusing him into neurosurgery as if you could beat a person into a mold. Upon graduation he got a good placement more because of his name than anything else, and as he became settled in his new job he met Kirla Ferr. Kirla was attracted to Aerdan because of the glamour associated with his family rather than any emotional attachment. Aerdan was something of a dreamer, wishing to travel, shirring away from his minor celebrity status while Kirla was aggressive, interested in social status and raising the family name. They withstood each other’s presence until the time for offspring came. Aerdan found himself between a rock and a hard place. though he enjoyed the duties of raising children and Kirla was disinclined to spend time with her family, she also insisted that Aerdan could not drop his duties. Things came to a head after a large gathering of both extended families, when Mithran announced that he had already found the perfect placement for young Ishe that would ensure her a good schooling in preparation of neurological medicine something he insinuated that she would need since her father was lacking in the proper skills. It was a night for the flaring of the infamous Andorian tempers, and Aerdan managed to get into succeeding arguments with his father and his wife, which cemented their separation. Kirla was uninterested in being burdened with a daughter, and she left to accept a prestigious posting designing new types of warp propulsions. Unfortunately Aerdan’s spat with his father caused the bulk of the blame and the shame to be heaped upon him. Not wishing to have his father control his life anymore, nor his young daughters he applied and was accepted into Starfleet Academy, searching for a new route through life and a way to give his daughter the freedom he did not have. After the Borg incident on ANDALUSIA and the creation of necessary but unfortunate bioweapon to combat the Zanders’ collective, Aerdan has withdrawn moreso than usual. It is still an incident he refuses to speak about. After the Dominion attack on the ROMA Starbase (which left his ex-wife dead) Aerdan decided to transfer to the USS PATRIOT and try to implement the new Chief Surgeon position created by Starfleet Medical. He served in the war for a year and at the end concluded that the position was poor in practice and resigned from it, completing a negative report to Starfleet medical. He has now been assigned to the USS PENDRAGON. Additional Education: Prior to academy entrance, he had been trained in neurological studies on Andoria. While this gives him some in depth knowledge of neurological surgery (particularly Andorian neurology), he found himself greatly lacking in many varied skills that Starfleet cadets often become quickly comfortable with, and so the bulk of his academy training has not focused on Neurosurgery but with the other aspects that make Starfleet personnel well rounded.